Safety should be the number one priority of all roofing specialists. 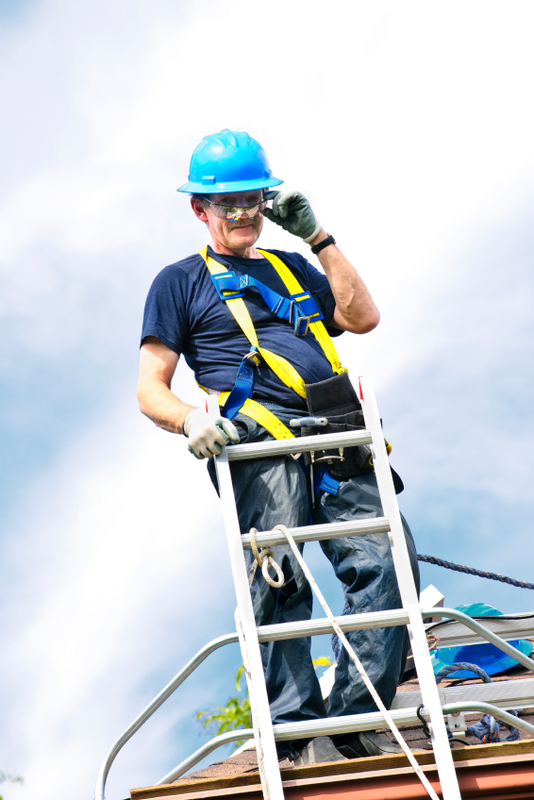 The potential for injury is exceptionally high during roofing work, and therefore companies must maintain a strict commitment to protecting their on-site personnel. There are a number of safety areas to consider when installing or repairing roofing. In this blog, we’ll go through three safety habits of the professional roofing company. Roofers must be able to analyze a roofing space and quickly determine potential safety challenges they could face during the completion of a project. The number one consideration is blocking off the area from those who are not working on the project. Another important item to consider is the positioning of power lines and roof access areas to ensure that each member of the team has a full understanding of how to safely work within the space. Professional roofers must use ladders that conform to Canada’s Centre for Occupational Health & Safety guidelines. It’s important that any ladders used are thoroughly inspected before use, as any damage can have an impact on the performance and safety of the equipment. Professionals should set the ladder against a solid part of the home and ensure that it’s secure enough to hold a team member’s full weight. And teams should also ensure the ladder is not left unattended, in order prevent movement or changes in the ladder’s positioning. Materials such as slate must be handled with care during the completion of a roofing project. In considering the safe-handling requirements of materials, factors such as the material’s weight and its structural qualities must be foremost in mind. It’s important for all roofing workers to consider how to safely and effectively carry materials across the roof while maintaining area safety. Materials should be stored as close to the working area as possible to help ensure seamless project completion as well as to minimize the amount of walking taking place across the roof area. Effective workplace safety is crucial to completing efficient roofing projects. To learn more on the various safety habits of the modern roofing specialist, contact our team directly today! This entry was posted in Roofing, Roofing Advice and tagged Durham region roofing company, experience roofers, finding roofing company, licensed roofer, Licensed roofer GTA, local roofing company, Newmarket Roofing company, professional roofing company, professional roofing tips, reputable roofers GTA, roofing companies GTA, Roofing Safety, roofing safety habits, York Roofing company. Bookmark the permalink.